Thinking Out Loud In Sturbridge: Sturbridge On The Map Again...err, Or Is It Off The Map? Sturbridge On The Map Again...err, Or Is It Off The Map? "For $148 in off -the-shelf parts, two Massachusetts Institute of Technology students have taken pictures from the edge of space. 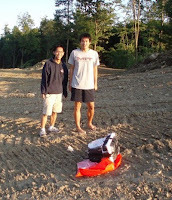 Justin Lee and Olivery Yeh’s DIY dirigible launched on September 2 from Sturbridge, Massachusetts and rose 18 miles before popping. It was recovered, photographs intact, upon landing in a nearby construction site. To carry the camera, a second-hand Canon A470 running open-source software that shot every five seconds, the students used a $30 weather balloon filled with helium from a party favor store. A prepaid c ell phone with enabled AccuTracking service sent GPS coordinates via text message. Protecting the apparatus from minus 50 degree Fahrenheit stratospheric chill was a styrofoam beer cooler and pocket hand warmers. Photographs and a full parts list can be found on the students’ website." Ma!! They Done Blowed Up Main Street! !